Was there really any doubt? The critics at Cannes raved, but they're not always the most reliable. But really. 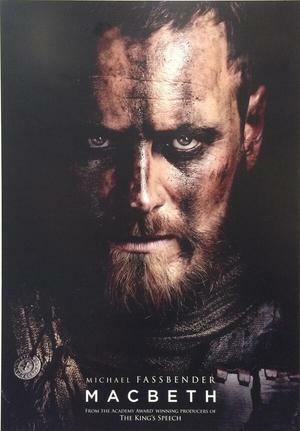 Michael Fassbender is just a magnificent and powerful actor. Period. And Marion Cotillard? I really wasn't sure the actress giving Lady Macbeth a French twist would work, but this first trailer for Macbeth looks, if I may state the obvious, bloody good. It looks, in fact, Shakespearian in scale. So what's the hold up with getting a US release date? The film opens in the UK on October 2 before it rolls out to a slew of other countries including Sweden on December 25th. Ha! Not exactly the typical Christmas fare! But for some reason, we still don't have an official release date for the U.S. Is it an American aversion to Shakespeare? Do distributors think all we want to watch is Avenger movies? If you hear of a release date, keep me posted, I can't wait to see this! Talk to me! I love that you're leaving a comment! Thanks. Congrats! You've just reached one of my most widely visited posts. I get it, lots of us want to hear what actors think about acting straight from their own lips. I've got a hunch if you find this post from 2013 interesting, you'll also find this year's more current video noteworthy too so I'm including it below. Cheers! Last Sunday I shared The Hollywood Reporter's Writers Roundtable, a lively discussion centered around the process and challenge of scripting stories for film, be it an original idea or adapting from another source. It was an interesting bunch of writers responsible for some of this years most talked about films including George Clooney and partner Grant Heslov (Monuments Men), Julie Delpey (Before Midnight), Nicole Holofcener (Enough Said), John Ridley (12 Years a Slave) and Danny Strong (Lee Daniel's The Butler). Earlier this week, we looked at Barnesville, GA, which stands in for Wind Gap, Missouri in Sharp Objects, starring Amy Adams. If you go wandering to Barnesville for a look-see what you won’t find is Adora’s gorgeous Gothic home. The gated mansion sits thousands of miles away in the Redwood Valley area of Mendocino County in California. This is the newest poster for The Woman in Black, the film based on the Susan Hill book. It's a big improvement over the last poster featuring the two creepy kids, right? And while I am not a huge Daniel Radcliffe fan (I'm not a hater, just don't care one way or the other) there are millions of people out there who are. Kind of foolish of the filmmakers NOT to promote Daniel's presence in the film! It comes out February 3. Maybe the strategy was to tease us with the scratched out eyes image plus the come on line "What did they see?" and bring it on home with the Fear Her Curse tagline?